The biggest design (furniture) fair of the world takes place today: The Salone Internazionale del Mobile. About 300,000 expected visitors of all over the world and a list of expositors is presented, which includes the “Who is Who” of the world of design as well as design new comers from the 8th to the 13th of April of 2014. Vitra presents some re-editions, such as the Swiss icon “Landi Chair” by Hans Coray of 1938, the Hexagonal Table by Alexander Girard from 1967 or the re-edited models EA 101, 103 and 104 of the Aluminium Group from Charles and Ray Eames, as well as some contemporaneous designs. 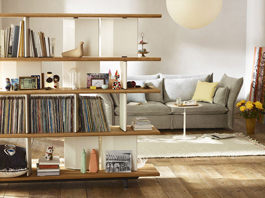 The designers Edward Barber und Jay Osgerby present their new Mariposa Sofa, the Planophore Shelf and one massive wood table with its suitable bench, also made for Vitra. 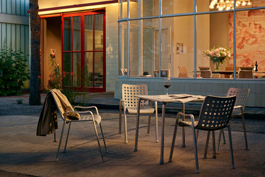 The Landi Chair was accompanied by the suitable “Davy” Table out of aluminium, made by the young Swiss designer Michel Charlot. Novelties of the Hal Collection by Jasper Morrison and already known Collections of Ronan und Erwan Bouroullec or Hella Jongerius were also exposed with the Leather Side Table or the East River Chair for example. The Danish company Hay presents its novelties in Milan on about 900m², including furniture, textiles, glass and illumination. Hay also presents products of the Wrong for Hay Collection there, after this one has been published on the London Design Festival in 2013 for the first time. The Salone Internazionale del Mobile takes place once a year since 1961. This year, the special EuroCucina fair for kitchens equipment takes place at the same time of the furniture fair. The EuroCucina used to take place every odd-year with the Euroluce, accompanying the Salone Internazionale del Mobile. Moreover there is an international exposition for furnishing accessories, which also enriches this years’ 53rd Salone Internazionale del Mobile with 1400 expositors: The Salone Internazionale del Complemente d’Arredo, existing since 1989. Find further information on the homepage of the organizer Cosmit spa.